The Raphael drop-in kitchen sink is sure to be an eye-catching focal point of any kitchen. This double basin sink by SINKOLOGY is a standard drop-in that makes replacing your old kitchen sink easy. A beautiful and luxurious kitchen is only a few steps away, just pull out your old kitchen sink and drop in this beauty. Featuring 4 faucet holes and mounting clip hardware this SINKOLOGY copper sink is an easy DIY project. Maintenance is also easy with our copper sinks, simply wash with soap and water. SINKOLOGY sinks are designed to make an impact and be a point of pride for your home, we also protect your investment with a lifetime warranty. The Courbet 30 inch copper apron front farmhouse kitchen sink makes a statement in any kitchen design. Making a farmhouse copper sink the focal point of your kitchen creates an immediate impact. Copper sinks by Sinkology are handcrafted from pure 16 gauge solid copper and protected by a Lifetime Warranty. With hassle free installation and effortless care, a copper sink from Sinkology is designed to fit your lifestyle and be a focal point of pride for your home. Design with the Sink in Mind. Take your kitchen to the next level with the new David Chef Series kitchen copper sink from SINKOLOGY. The Chef Series David features a highly functional and user friendly rear corner drain location. Corner drain location allows for maximum bowl utilization, and large pans and pots to fill your sink without covering the drain and slowing drainage. The innovative drain location allows for proper ergonomics when wiping food off dirty dishes directly into the garbage disposal. The Chef Series David is handmade from 16-Gauge ultra-pure copper and features a 9.25 in. depth bowl and Lifetime Warranty. Design your kitchen around the David single bowl copper kitchen sink from Sinkology. The David kitchen sink is created for the professional chef or home cook who demands the best. This sink features an extra deep 9.25" bowl and easy to clean tight radius corners allowing for maximum bowl utilization. Hand hammered and finished by skilled artists who ensure only the finest craftsmanship. The new Sinkology David sink is protected by a lifetime warranty and made from solid 16 gauge pure copper. Raphael Drop-in Handmade Pure Solid Copper 33-inch 4-Hole Double Bowl Kitchen Sink in Antique Copper The Raphael drop-in kitchen sink is sure to be an eye-catching focal point of any kitchen. This double basin sink by SINKOLOGY is a standard drop-in that makes replacing your old kitchen sink easy. A beautiful and luxurious kitchen is only a few steps away, just pull out your old kitchen sink and drop in this beauty. Featuring 4 faucet holes and mounting clip hardware this SINKOLOGY copper sink is an easy DIY project. 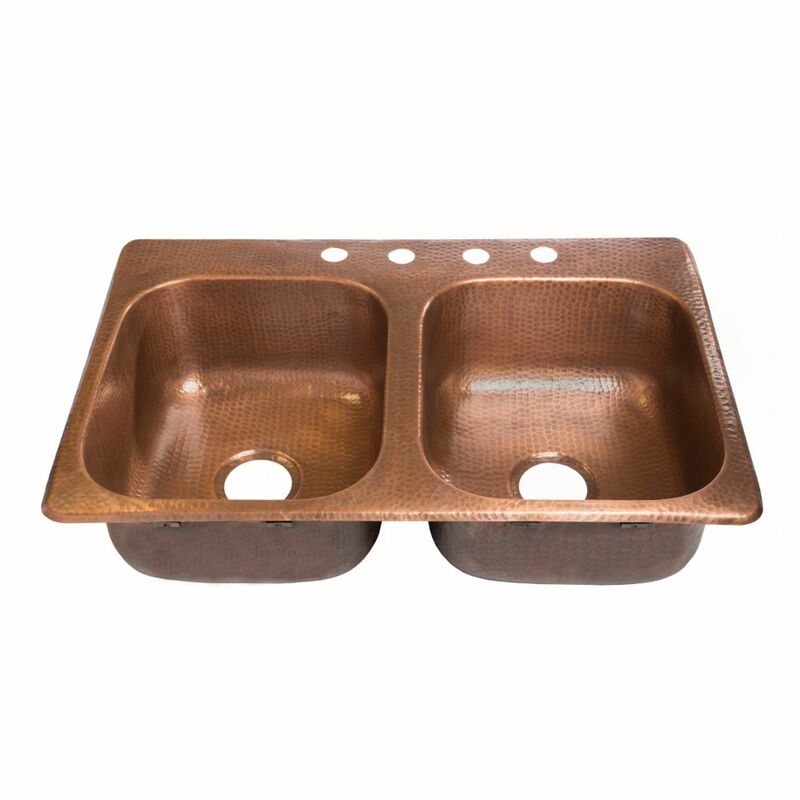 Maintenance is also easy with our copper sinks, simply wash with soap and water. SINKOLOGY sinks are designed to make an impact and be a point of pride for your home, we also protect your investment with a lifetime warranty. Raphael Drop-in Handmade Pure Solid Copper 33-inch 4-Hole Double Bowl Kitchen Sink in Antique Copper is rated 4.3 out of 5 by 56. Rated 4 out of 5 by HomeDepotCustomer from We love the sink (installed about 4 months ago). ... We love the sink (installed about 4 months ago). We did need to straighten out two areas on the lip of the sink during installation, but no big deal. We get lots of comments on how cool it is and still love looking at it. Rated 1 out of 5 by Phyletia from It's great (except for the inconvenience of having to return it due to it arriving with a dent at... It's great (except for the inconvenience of having to return it due to it arriving with a dent at the side where the faucet goes and reordering); and there is one row of "decorative indentations in a straight row that appear to be a second dent! I'm glad that I ordered a week before the scheduled installation. Rated 5 out of 5 by Nate from I'm 76 years old and I recently installed this sink by myself, changing the faucet and garbage di... I'm 76 years old and I recently installed this sink by myself, changing the faucet and garbage disposal after removing a cast iron sink. It's very attractive and surprisingly quiet when running water. It's been a great addition to our kitchen. Rated 1 out of 5 by cheap from SINK NOT PERFECT. ARRIVED DENTED. SINK NOT PERFECT. ARRIVED DENTED. Rated 5 out of 5 by Msfreckles from This sink made a beautiful and unique addition to my kitchen....I LOVE IT! This sink made a beautiful and unique addition to my kitchen....I LOVE IT!